Our staff in Colorado can't help but worry about all the victims of the wildfires in Boulder, Colorado Springs and Ft. Collins. Some of us are personally impacted or know someone who is. While Coloradans have banded together to pray for rain to help ease weather conditions, we couldn't help but wonder the meaning of rain. 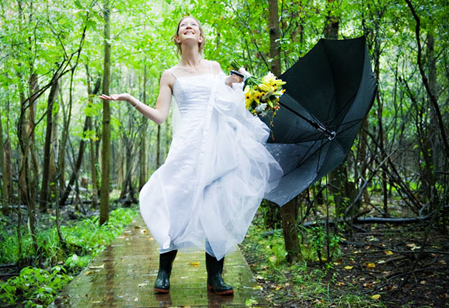 After all, every bride has heard that it's considered "lucky" if it rains on her wedding day. Is such a superstition true? In our research, we learned that rain is a symbol of many things. For one, it brings moisture to dry areas, which can create life and help plants grow and animals hydrate. Rain and water are essential to life on earth. Further, rain is often considered a symbol of fertility. Water helps things grow. A couple may hope that one day their marriage will be blessed with children. Rain also is symbolic of a new start. The water can cleanse the earth and help wash away past debris. A marriage is a new start for a couple. If it rains on your wedding day, consider yourself blessed with a clean slate. Remember, if it rains on your wedding day, don't be bummed; rather consider your marriage to be blessed with good fortune. Just make sure if you decide to take pictures outside in the rain, bring along a beautiful umbrella to match or contrast your gorgeous wedding dress. Consider an umbrella one of your must-have wedding accessories if you think there is a chance for rain on your wedding day. Oh, and if you want to know your best chances to have a "rainy" wedding day, reference the Farmer's Almanac to see which days offer the best chance of precipitation. Good luck! Please leave us a comment. Brides, did it rain on your wedding day? If so, how did you cope?